Making balloon animals is a great skill to have for entertaining children. Whether you are a parent, magician, clown, or health care worker, you can delight the kids with your custom creations. Learn how to get started as a beginner, from the types of balloons you use to the basic techniques and step-by-step instructions for the balloon animals themselves. Rather than just buy any type of long balloons, use high-quality twisting balloons such as are produced by reputable companies including Qualatex and Betallatex. You will have fewer problems with popping as these twisting balloons are thicker and designed to take the stress of multiple twists. Most of the standard sculptures are geared toward the use of size 260 balloons. There are also larger and smaller sizes, but a beginner should invest in packs of the 260 size. You will also want to buy a good balloon pump to save your lungs. Look for a dual action hand pump. With this type of pump, air will be expelled both on the up and down stroke, inflating the balloon quicker. Once you have mastered balloon animals and want to do it frequently, a floor pump is a good investment. Inflating a balloon to make balloon animals is far more than simply blowing them up. The most important thing is not to inflate the balloon too much. You need a good amount of uninflated balloon left to be able to finish your balloon sculpture and ensure the twists are not under too much pressure. Leave a 1-inch uninflated tip at the end of the balloon. This should provide enough leeway for twisting, as when making a basic balloon sword. Balloon artists often release a bit of air from an inflated balloon by releasing the nozzle that’s held in their fingers before tying it off. This process is known as “burping” a balloon. It’s a valuable technique. The basic balloon twist is the foundation for everything that you make through the art of balloon animals. You hold the balloon in your non-dominant hand at one end. Then you grasp it farther along its length with your dominant hand and twist it. At this point, you must keep hold of the balloon to maintain the twist as it will otherwise untwist itself. After the basic twist, the second fundamental skill in balloon twisting is the lock twist. The lock twist holds the balloon's segments in place securely and it is the basis for the head, ears, legs, and body of balloon animal sculptures. To make a lock twist, you make two basic twists along the length of the balloon so you have four balloon segments. Since you have to keep a grasp on the two twists, it's best to make them fairly close together. Then bend one end of the balloon against the other end of the balloon so it is bent between your second and third balloon segments. Grab the two middle segments and twist them together (three times at least) isolating them from the rest of the balloon. Now the twists should be locked and secure. 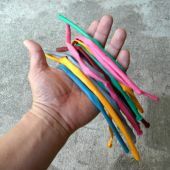 The fold twist (also called a loop twist) is a fundamental twist often used to make "ears" on animals and is the foundational twist in basic sword balloon animals. It is a lot like the lock twist, but your initial two twists are farther apart. You fold the longer middle segment in half so the two twists are aligned. Then you twist the at the two existing twists a few times. Now you have a loop segment. Dog balloon animals are the fundamental sculpture in the art of balloon animals. 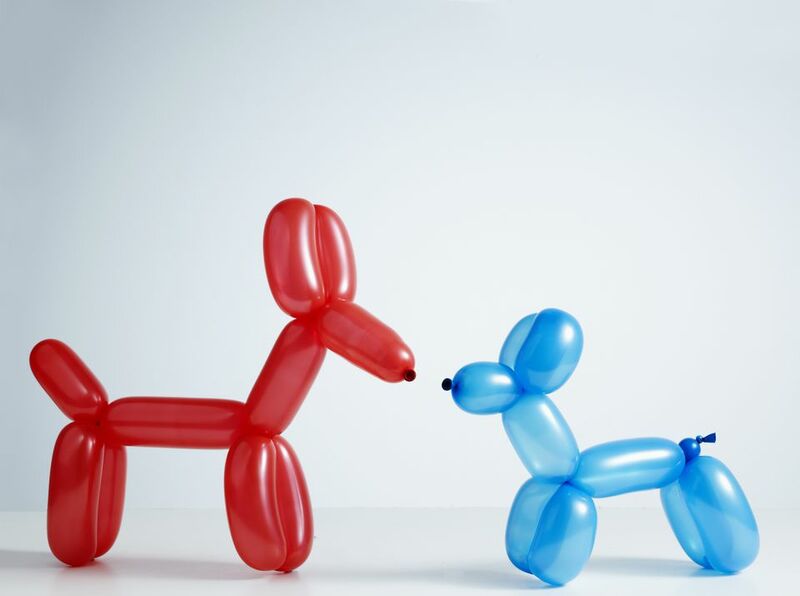 Many balloon animals such as the deer and giraffe are variations on the dog balloon animals. And you’ll find that the basics that you master when twisting dog balloon animals, will apply to more difficult balloon animals. Once you've mastered the basic techniques of making balloon animals and can easily make dog balloon animals, here you'll find detailed instructions on how to make a variety of balloon animals.